The American Cowboy Chronicles: Do Republicans Hate Trump And Want Clinton? There is no doubt in my mind that some Republicans want Hillary Clinton as our next president. Yes, that's exactly how I see it. Yes, I really believe that some Republican low-lives will stoop as low as they can to get her elected. I try to keep up with the news concerning politics. I watch news reports. I listen to debates between political pundits. I read a number of different views on what's taking place. I try to keep track of how Democrats are attacking Donald Trump. I was even keeping track of how Republicans are attacking him. I understand how Democrats lie and cheat and steal to win elections, how they create phony issues of "concern," drum up non-issues, and even how they fake indignation while they smear Republicans and their families. I understand how Democrats have no core values and will screw over anyone if it means winning. Frankly, I've never seen Republicans do the same until lately. And yes, sorry to say, but I've seen this in attack after attack on their own Party's presumptive nominee Donald Trump. So now, now I've come to the conclusion that there are Republicans working within the Republican Party who are working to put Hillary Clinton in the White House. What other reason can there be to refuse to support or help fund Donald Trump? What other reason is there to attack our party's nominee? What other reason do they have for their hate for Trump? The only answer to these questions is that they are actively working get Hillary Clinton elected. Yes, that's the conclusion that I've come up with when taking a look at the actions of Republicans this year. And friends, I'm so angry at them that I'm thinking about leaving the Republican Party over this. Granted that I have sworn my vote to anyone, anyone, who runs against Hillary Clinton. I see Hillary Clinton as worse than Obama because she's more conniving than Obama is. Hillary Clinton as president will be over-regulation, more government intrusion in our lives, more of the same of the Obama administration and worse. There will be even more graft and corruption, more favoritism and cronyism, and more Socialism and out of control spending. If Hillary Clinton is elected than I see someone in the White House who will sell out America without giving it a second thought. And why do I feel that way you ask? It's because Hillary Clinton is an open book. She is a contemptuous liar whose track record shows these things that I'm talking about. She has repeated shown that she cannot be trusted with our nation's highest office. But friends, that doesn't seem to matter to Republicans who are supporting Hillary Clinton. Not even Hillary Clinton's past criminal behavior matters to Republicans who hate Donald Trump. I hear so-called Republicans on television attacking Donald Trump mercilessly, all the while spreading lies about Trump and his family. While I shake my head, I always come away from watching those interviews with those so-called Republicans "Insiders" with the thought, "Why can't you find such venom when it comes to taking about Hillary Clinton, her past, or her family?" Hillary Clinton is tapping into the Republican hate for Donald Trump. She has even launched a website called, "Republicans Against Trump". Hillary Clinton’s campaign is targeting those RINOs who are said to be frustrated and don’t support Donald Trump. 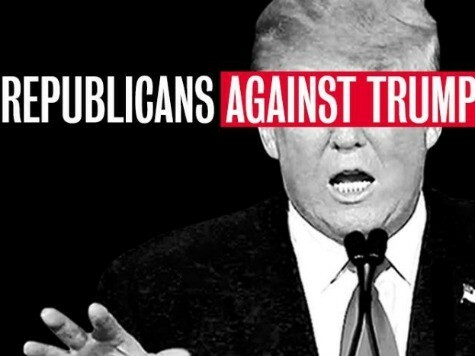 The Clinton campaign is buying ads to promote the website, and promises all of her Republican supporters a free "Republicans Against Trump" bumper-sticker. For that bumper-sticker, Hillary Clinton is asking her Republican supporters to take the following pledge: "Donald Trump is not qualified to be president. He does not represent my beliefs as a Republican and, more importantly, my values as an American. He does not speak for me and I will not vote for him." So Why Do Some Republicans Hate Donald Trump? Besides the Republican "insiders" who are mostly sore losers in that their RINO candidate didn't make it, why are Republicans supporting Clinton over Trump? And really, why not use the same venom by asking about her breach of National Security, the FBI criminal investigations of her actions, or how she has gotten over $20 Million for her campaign from Saudi Arabia for starters? They won't, and instead Republicans attack Donald Trump for his "insensitivity" and supposed lack of knowledge of how politics works. Friends, many of us are sick and tired of how politics works. For me, "sensitive" is code for "Political Correctness." And frankly, the last time I heard a Republican speak his mind instead of being "sensitive" was Ronald Reagan. While some of the young punks in the Republican Party are too young and dumb to remember, Ronald Reagan called a spade a spade and said it like it is just like Donald Trump has been doing. His reputation for taking action prompted a lot of our enemies around the world to straighten up. If that is achieved with electing Donald Trump, I'm all for it. And as for some saying Donald Trump gets angry, I say "Great, because a lot of us are angry as well!" Like many of us who are voting for him, we like that he doesn't take crap off of anyone. Many of us are sick and tired of having a bunch of sensitive pantywaists in the Republican Party. Many of us are tired of the wimps who consistently bent over and take it again and again from Democrats. Republicans like Paul Ryan, John McCain, Mitch McConnell, Jeb Bush, Marko Rubio, and Mitt Romney are Liberals. They are not Conservatives. They are the gutless wonders who sold out all of their Conservative principles for power. These people are not for smaller government, or fiscal responsibility, or reining in corruption, or stopping the Federal government's overreach or its over-regulation. These Republicans are Liberals. They are the same as the Democrats who see nothing wrong with an all powerful Federal government controlling every aspect of our lives. These Republicans are the one's too afraid, too timid, to transgender, to stop Obama and his cuts to our military while increasing funds to Muslim refugees. These are the same weak kneed Republicans who won’t stand up and fight against racial problems coming from minority communities all because they don't want to be called "racist". Yes, these are the Republicans who are too damn afraid to be Conservatives and instead now attack Donald Trump and support Hillary Clinton. So Why Do Some Republicans Want To See Clinton Elected? The answer to why is that these so-called Republicans see more money and power under Hillary Clinton than they do under Donald Trump. And yes, that is really what the Republican Party "establishment" is all about. Yes, from what I can see, there are a lot of Republicans who are working to get Hillary Clinton elected. They will do anything to attack Donald Trump. They will try to stop his message from getting out, stop him from raising needed contributions, and will ultimately put Hillary Clinton in the White House. I believe those Republicans will be the downfall of the Republican Party. Are they all bad? No, but some Republicans are no different than Democrats.